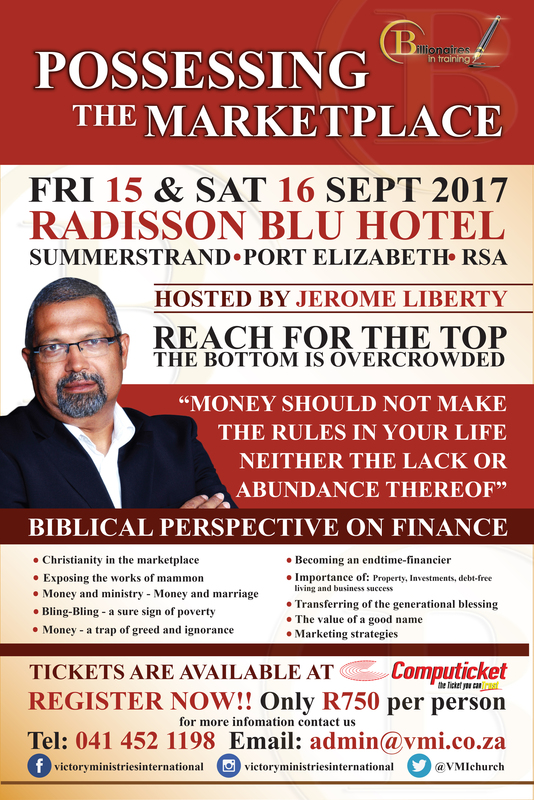 Billionaires-In-Training 2017 “Possessing the Marketplace” will be held from 15-16 September 2017 at the Radisson Blu Hotel in Summerstrand, Port Elizabeth, South Africa. The annual conference is aimed at empowering Christians to use their entrepreneurial gifts to advance the Kingdom of God. This initiative seeks to raise the next generation of billionaires in the Kingdom of God, a ground breaking vision given to business man and church pastor, Jerome Liberty. It will raise the next generation of Christians in business who through networking and partnering will take the marketplace for God. One of the purposes of the conference is to educate on the importance of having the right relationship with money and doing business with a purpose; developing a breed of generals in the marketplace that will forefront wealth transfer from the unjust to the righteous. We live in a world where the love of money and materialism wreaks havoc in families, churches, cities and nations. There is the strong desire and passion to achieve more than average business and financial prosperity, but to be stewards of God’s resources to advance a Kingdom message. Through Billionaires-In-Training, Christian business people will be empowered through Biblical perspectives on finances, to add value by investing in people than just concentrating on materialism and bling-bling. We are establishing financial structures by raising end-time financiers to ensure generational blessings. 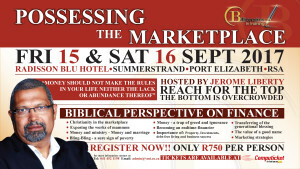 The conference features Jerome Liberty, a businessman and founding pastor of Victory Ministries International. Since the mid-1990s he presented finance workshops in South Africa and recently in Bolivia, teaching people on how to get out of debt, how to pay-off their mortgage bonds, how to break the curse of poverty, and the restoration of families’ integrity. The businessmen and women who spoke at previous conferences are former finance MEC and SABS chairman, Martin Kuscus, the founder of the multi-billion dollar Mergon Group, Francois van Niekerk, Port Elizabeth attorney, Nadan Naidoo, award-winning business woman, Dr Bridgette Gasa, and professional speaker and sales trainer, Shelley Walters. The commonality among the speakers are their pioneering contributions in business, their humility and the level of integrity they bring to God’s name. Possessing the marketplace is in essence a powerful message to change mind-sets and attitudes within the church in how it views the marketplace and thereby expanding the role of the church in the marketplace. Built on the very core teachings of the Lord Jesus on being Kingdom-minded, the marketplace message ushers in new and fresh revelatory wisdom and understanding on the importance of the marketplace in relation to God’s Kingdom; why believers should reign in the business domain, and how to achieve and sustain a purpose-driven prosperity in the marketplace. Kingdom Finance is more than having your needs met. It is coming to a place of maturity where God can trust you with His reputation as you become managers of His resources. Watch this space for breaking news and new developments. Billionaires In Training 2017, Possessing the Marketplace: Recommended accommodation close to the event venue.